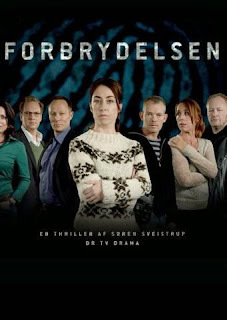 Aside from pastries, bacon and Sandi Toksvig, the best thing to have come out of Denmark in recent years is supposedly Forbrydelsen. Or 'The Killing', as unilingual speakers like myself prefer to call it. Unfortunately, as a general rule, this family's TV viewing habits are more inclined towards ITV2 than BBC4. That's if we're not watching CBeebies. If we want highbrow, we watch 5* and the closest we get to anything intellectual is the Big Brother 'Bit on the Psych' show. But having found ourselves hooked on 'Broadchurch' last year, I read this article in The Daily Telegraph (I didn't buy it, I used it to line Chloe's litter tray), and decided that 'The Killing' really ought to be on our hit list. The problem is that we struggle to find the time to watch a weather forecast, never mind a twenty-part series, and by the time we've got the kids to bed, had something to eat, and looked with exhausted despair at the wreckage of our formerly simple lives, we barely have the strength to read a copy of TV Quick, never mind an hour of Danish subtitles. But whilst working in Horsham last Thursday, I visited one of their fine charity shops and found the DVD box set of series 1 & 2 of 'The Killing' for only £5. So I bought it. And frankly I made a killing. The cheapest seller on the Amazon marketplace is flogging it for more than forty quid. What's more, it's clearly unwatched and never been opened. I suspect it was an unwanted Christmas gift donated by a member of UKIP. So in an effort to salvage our grey matter before our brains turn entirely to child-ravaged mush, Lisa and I sat down last night and watched the first episode. Followed immediately by the second. I can't shake the feeling that Sarah Lund's Danish accent sounds a bit like Geordie, and I'm uncomfortable with a 19-year-old called Nanna, but other than that, we love it. We've got twenty-eight more episodes on seven DVDs, but if we can persuade the kids to look after themselves, I think we'll have them watched by the weekend. When I watched it last year I found it so addictive that I'd watch three or four episodes at a time - even though you can't do anything else, and have to keep watching, to read the subtitles. Unless you speak Danish of course. Would you like me to tell you who did it, and free up all those hours for productive pursuits? If anyone reveals whodunnit, I'll be filming series 4 of The Killing myself.